In this video, incredible creativity and ingenuity is demonstrated. (My creations, a new form of life) But notice the use of the words "animal" and "evolution" in relation to the robots. The implication is that humans can create living creatures and that those creatures evolve. Neither is true. The robots are not alive in a biological sense. But even if they were, the takeaway would not be that living things can arise spontaneously as evolution argues. The conclusion would be that intelligence, ingenuity, and creativity are necessary for the formation of life. This is not to mention that humans have never observed life spontaneously generating from inanimate matter. Nor have humans been able to create a living creature in spite of marshalling all the technology and knowhow available for the past hundred years. But we are to believe, according to evolution, that mere stardust and energy on its own will eventually create the cosmos and the panorama of life on Earth. 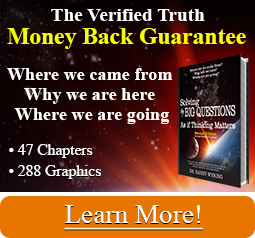 See the Big Questions book for more detail and how the idea of evolution is in direct violation of several scientific laws.